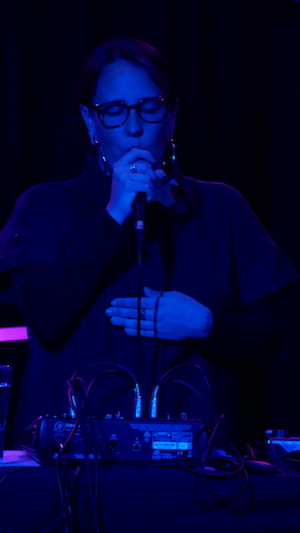 Tura New Music’s most recent gig was an evening of live processed electronic music from Perth local Akioka (aka Tess Jane Darcey) and Melbourne stalwart Robin Fox. Akioka’s set opened with looped Mongolian-style vocals (a nasal, ringing tone) which were soon layered with the singer’s very convincing impersonation of larks and magpies. This was coupled with ethereal human calls, not altogether unlike those of Kate Bush. Akioka gradually altered this material into a more abstract set of tightly looped, droning material, in the vein of Pauline Oliveros. From here Akioka’s focus became increasingly structural and rhythmic, with slow pulses turning into rapid beats. This transition out of something akin to electroacoustic composition or sound-art and into something closer to rather noisily idiosyncratic IDM (so-called “Intelligent Dance Music”) was well handled — although the regular short drop-outs in the music and the slightly uneven beat-matching meant that each musical repetition had to re-establish the attention of the listener. The acoustic distinctiveness of Akioka’s at times rather odd acoustic combinations, however, came to feel slightly uneven to my ear. The inclusion of poorly synthesised high-hat clashes, for example, seemed inconsistent with the rest of the sonic palette. Personally, if I am going to listen to techno or IDM, I want my beats more banging than this. Such questions of personal taste aside though, it was a very engaging set. Darcey currently performs in quite a number of genres and guises, and one suspects that her sound is continuing to evolve. I look forward to future output. If avant-garde techno proved just slightly out of reach for Akioka, this fusion of stylistic approaches across a diverse set was well and truly nailed by electronica veteran Robin Fox. It was unfortunate Perth was not treated to one of Fox’s totally overwhelming sound-and-laser shows (see http://robinfox.com.au/projects/laser/). 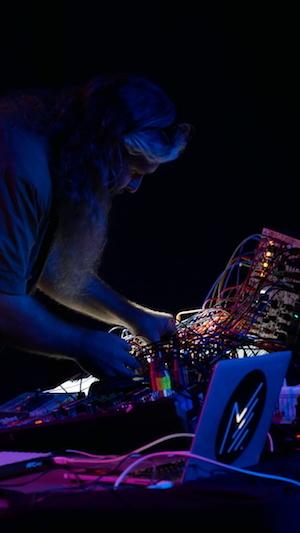 He did, however, perform live using a laptop connected into a custom built modular array of hand-patched processors — in other words a messy box full of wires connecting different circuit pathways! Befitting such an old skool way of arranging electronics, Robin Fox’s set opened with a deep, resonating bed of 1960s sounding synthesiser drone. Photo: Tristan Parr. Befitting such an old skool way of arranging electronics, the set opened with a deep, resonating bed of 1960s sounding synthesiser drone — the sort of thing the BBC radiophonic laboratory used to produce for films like The Quatermass Experiment. Beneath a massive organ chord whistled higher pitches, echoing around within small spaces dotted across this larger field, before the higher pitched material gradually rose in frequency and bled outwards. An increasingly rapid switch-like tick came to the fore and Fox rounded off this section by using a modified mouse controller to perform a rapidly changing, squelchy, hiccupping and ticking solo. Sounds slid about, briefly coming to rest, before being split and multiplied. Although distinctly electronic, it had something of a glottal, vocal quality, and recalled quite closely Fox’s contribution to Coagulate (2003) — though here, perhaps, produced with a slightly less bludgeon-style approach! Fox briefly exited this mode by offering a stripped back, deep pulse, working the bass amplifiers even more than previously. This was followed by airy, tearing sounds wafting and slapping about in the background. But then these beds of sound broke up, and we were back into crinkly, scratched exclamations — at least some of which seemed to be processed percussion sounds. This dropping back into a more open acoustic space which is then punctuated by smaller, discrete elements is something of a classic structural shift in Fox’s oeuvre, and here, as elsewhere it offered a surprisingly meditative plateaux within what was otherwise an often very intense set. It did not take long, however, for this to coalesce again into an almost vocal sounding, Dionysian din underscored by massive bass thuds. At this point the set effectively became a live techno concert. The intense multi-harmonic density of Fox’s palette may be somewhat distant from rather lighter sounds employed by Juan Atkins and Derrick May, but it was not altogether inconsistent with some of Model 500’s harder material. Certainly, Fox’s version of techno feels a bit more punk or Cabaret-Voltaire-esque than that of most of its founders. In addition to this, the spiralling secondary beats and sound effects add something of an acid or trance feel. Indeed, I was rather disappointed there was not a dance floor in the venue, because Fox’s thundering banger of a set here deserved a physical response. Personally I was thrown back to days when live techno performers successfully competed with skilled disk-spinners and I was listening to the likes of Voiteck in Melbourne. Fox soon morphed the beat into a pulsating, thuddering wall of noise underwritten by drum-machines, which eventually wiped everything else out of the mix. The set therefore ended on a gigantic, all engulfing tumult of rips and noise, leaving the audience dazed and washed up on shores unknown. It was a masterful set and a great example of just what years of experience in the electronica scene can produce. Let us all hope Fox might be able to add lasers to his next Perth visit! Pictured top: Robin Fox, photographed by Tristan Parr.